Congrats to our May Teachers of the Month, Ms. Nuval and Mr. Ayala! 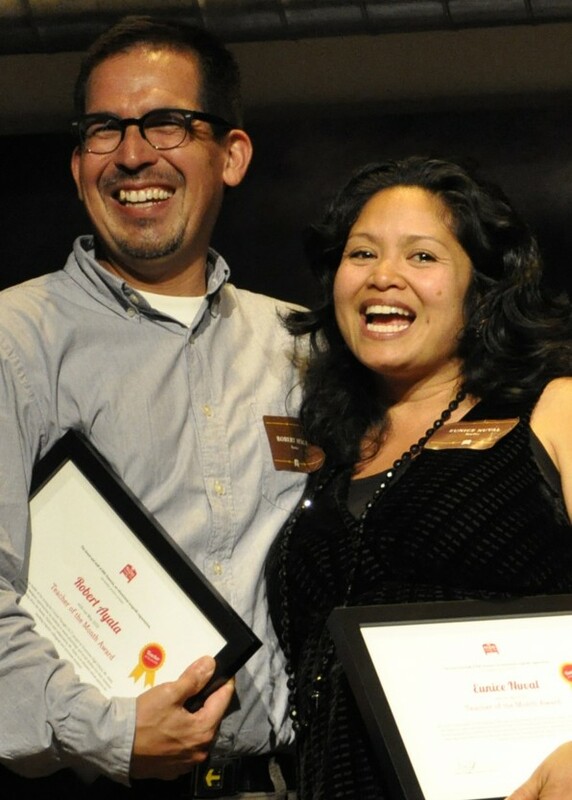 826 Valencia sends our enthusiastic congratulations to our May Teachers of the Month, Eunice Nuval and Robert Ayala of Downtown High School! We here at 826 had the pleasure of working with Ms. Nuval and Mr. Ayala while completing our tenth annual Young Authors’ Book Project, Arrive, Breathe, and Be Still. You can read the article about the project here. The student playwrights of Downtown High School dedicated the book to their fantastic teachers, and we think they’re pretty special, too. In addition to our undying gratitude, Ms. Nuval and Mr. Ayala were awarded a certificate and $1500. We here at 826 Valencia have had the pleasure of working with Eunice Nuval over the course of several semesters. Ms. Nuval shows complete dedication to everything she does, and her high standards for her students are evident in the quality and maturity of the work they produce. In the classroom and at 826, Ms. Nuval has been an inspiration. Ms. Nuval’s partner teacher, Robert Ayala, has also been a wonderful resource in the formation of Arrive, Breathe, and Be Still. He dedicated evenings and nights to the project, ensuring that each student had their voice heard and their stories honored. His dedication to education and to the students of Downtown High School is admirable.